In what they call a ‘Beehive’, Jollibee workers who were illegally dismissed kicked off their indefinite campout at the gate of JFC’s (Jollibee Foods Corporation) main office in Paranaque today. Before trooping to the company’s main warehouse, members of SM-JFC (Samahan ng Manggagawa sa JFC) held a ‘die-in protest’ at the Jollibee head office in Pasig City. Workers’ ‘die-in’ protest at the Jollibee main office in Pasig. Photo by Kathy Yamzon. Workers slammed the termination of agency service contracts of JFC with Toplis Solution and Staff Search Agency that led to the massive dismissal of hundreds of its warehouse workers. During the protest, hundreds of protesting workers expressed their rage against JFC’s non-adherence to the labor department’s compliance order to regularize thousands of its workers. The groups also urged DOLE officials and President Rodrigo Duterte to intervene and be hands-on on regularization in JFC. They also reiterated their appeal for Bello and Duterte to look into the moves of JFC that circumvented previous rulings against LOC. 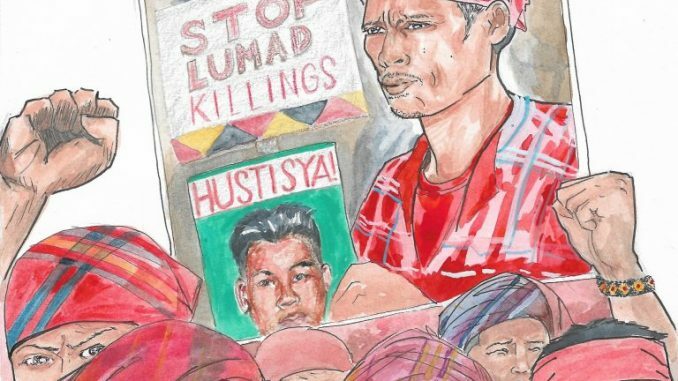 “We call on the Duterte government to take up decisive actions for the benefit and welfare of the hundreds of jobless workers of this abusive fast-food giant. JFC workers deserve to be regularized, higher wages, substantial benefits and better working conditions,” said SM-JFC President Rogelio Magistrado. SM-JFC and Defend Job Philippines also enjoined the public to support their struggle for their reinstatement and regularization by temporarily restraining from patronizing products of JFC and its affiliates and subsidiaries. The groups asked for the regular customers of JFC for understanding and sympathy by looking for other fast food options and by having a temporary ‘Jollibee diet’ by not dining in Jollibee, Chowking, Greenwich, Red Ribbon, Yong He King, Hong Zhuang Yuan, Mang Inasal, Burger King, Highlands Coffee, Pho24, 12 Hotpot, Dunkin’ Donuts, and Smashburger. “A single order of regular fries, burger or drinks that will be deducted to the earnings of JFC can contribute a lot to the long-drawn demands of contractual workers to be regular employees,” appealed to the public. 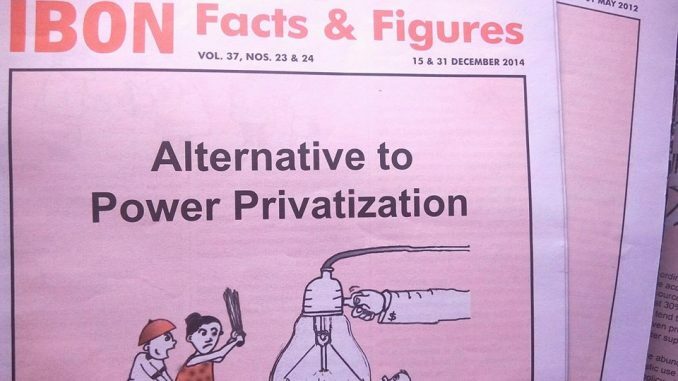 The group emphasized that every single cent not earned by JFC would put strong pressure on the company to listen to their clamor for regularization. The groups also encouraged netizens to express their support to them by posting their ‘Jollibee diet’ in their social media accounts and by by using the hashtag #BEEastMode. According to Magistrado, as JFC left them with nothing but joblessness, they have nothing to do but to resort in camping out at the company’s main pinnacle. SM-JFC and Defend Job Philippines said that the JFC commissary and warehouse, where they set up their ‘Beehive’ is engaged in storing, handling and distributing products and other logistical needs of all other warehouses and Jollibee stores in Luzon. They provide logistics services to Jollibee, Chowking, Greenwich, Burger King, Mang Inasal, and Red Ribbon. “We call on all contractual employees of JFC, our government officials, netizens and other supporters to visit us in our ‘Beehive’. To show solidarity, we encourage all workers in different warehouse and stores under JFC to launch various forms of sympathy protests down to the store levels to amplify our unified call for regularization,” said Magistrado. Magistrado stressed that they are determined to defend their camp at all cost, until the JFC management face them and give them their legitimate and just demands to be reinstated and be regularized. 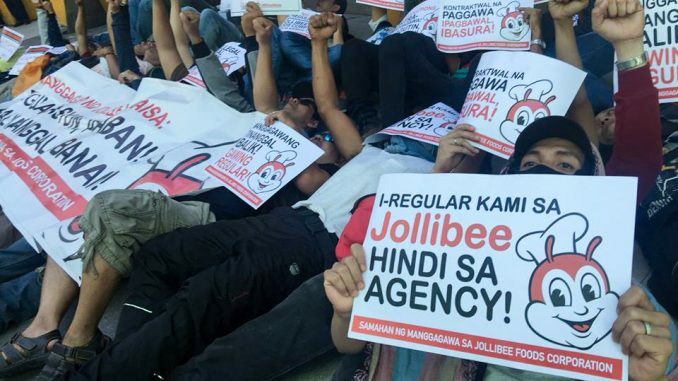 The post Laid-off Jollibee workers camp outside company warehouse appeared first on Manila Today.